Women philanthropists figure prominently in the early history of the University of California. Some of these financial benefactors are quite well known today because their family names, such as Hearst and Sather, are attached to major buildings on the Berkeley campus. In most cases these donors were women who outlived their wealthy husbands and decided to expend much of the family fortune on worthy causes, including the University. One of the most intriguing and important women donors is, however, not as widely remembered at Berkeley as others such as Phoebe Hearst or Jane Sather. This was largely by her own choice. During her lifetime Annie Montague Alexander refused most public recognition and avoided attention for her substantial gifts to the University. Even the museum that she had essentially created and sustained had to implore her for a single portrait photograph of herself to keep amongst their records. Her reluctance to be placed in the public eye may have been motivated by her upbringing, personal shyness or rectitude, some early bad encounters with a sensationalistic press, dislike of ostentation or perhaps — at least in part — by the fact that she spent most of the first half of the 20th century in a committed relationship with another woman. Annie Alexander’s benefactions to the Berkeley campus were extensive and extended. She was largely responsible for establishing and financially supporting both Berkeley’s Museum of Vertebrate Zoology and the Museum of Paleontology. Alexander’s labors on behalf of science came at a time when the “wild West” was vanishing, but West Coast scientific institutions still largely lacked the research collections necessary to attract and retain the best scholars. Alexander’s dedication to building the two museum programs made a vital contribution to the academic quality of the Berkeley campus; both facilities are now regarded as among the best of their type in the United States, with large, admired and, in some cases, unique, collections of specimens. Unlike many donors, Annie Alexander gave her own time and expertise as well as money. 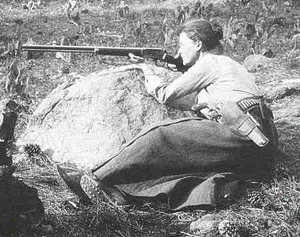 In an era when women in the sciences were either unheard of or (at best) considered unusual or even unnatural, she became a premier scientific collector, spending months each year on field expeditions. When she financed a large expedition she usually accompanied it and, despite being treated as the camp housekeeper and cook by many of her male research associates, found time personally to discover and document a number of new species. She gathered, prepared, and gave to the campus museums tens of thousands of specimens of animals and fossils from all over the world. Alexander was drawn to nature from her earliest years. Born into a family made wealthy by sugar (she was a part heir to the C & H Sugar fortune), she spent her early years growing up on the Hawaiian island of Maui, before the family moved to Oakland. Alexander shared with her father, Samuel, an interest in travel and a sense of adventure, and they often traveled together. They were trekking through Africa where he was killed in an accident on a visit to Victoria Falls in 1904. Samuel Alexander had not pressured his children to marry, and Annie was 37 and single when he died. But her life was about to change. A few years earlier she had started to audit classes at the University of California, attracted to the lectures of John C. Merriam, a paleontologist and professor of geology. With ample financial means of her own she began to offer both financial support and time to the University’s research and collecting programs, support which would quietly continue for nearly five decades. In 1908 Alexander sought a female traveling companion to accompany her on a collecting trip to Alaska, perhaps so she would not be the only woman on the expedition. In that era, two women travelling together would elicit less attention than one. Alexander invited Louise Kellogg, a 29 year old Oakland resident, schoolteacher, UC alumna (Class of 1901) and cousin of Martin Kellogg, a distinguished Professor of Latin and former UC President. This trip marked the beginning of a 42 year relationship between the two women. 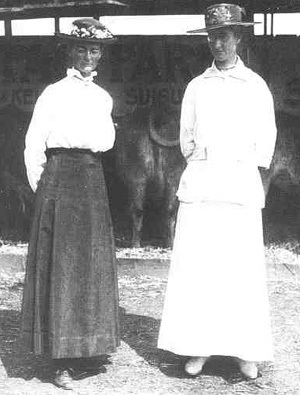 Kellogg enthusiastically joined Alexander on her collecting expeditions and travels and became a knowledgeable collector in her own right; in time, the two of them collected, documented, and donated more than 22,000 plant, animal, and paleontological specimens to the University’s scientific collections, often spending weeks or months in remote areas of the American West, and once collecting as far afield as Egypt. Alexander and Kellogg were, by all accounts, devoted to each other, forming an indefatigable team and a harmonious partnership. They maintained separate residences in Oakland, but in 1911 bought, developed, and began operating a farm on Grizzly Island in the Sacramento River Delta, where they lived part of the year, quite happily, in considerable isolation. 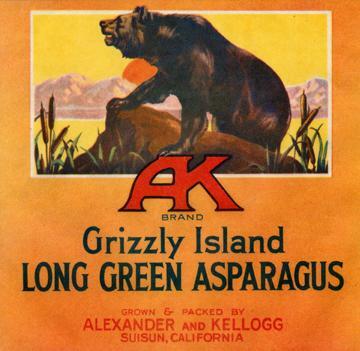 Their farm was a serious working venture and their asparagus, among other products, became nationally known (the farm is now part of a wildlife refuge). If that first-hand recollection is correct we are entitled to remember Annie Alexander and Louise Kellogg not only as strong and independent women of their era, major early benefactors of the University of California, and remarkable natural history collectors, but also as one of the University’s earliest known and most distinguished lesbian couples.